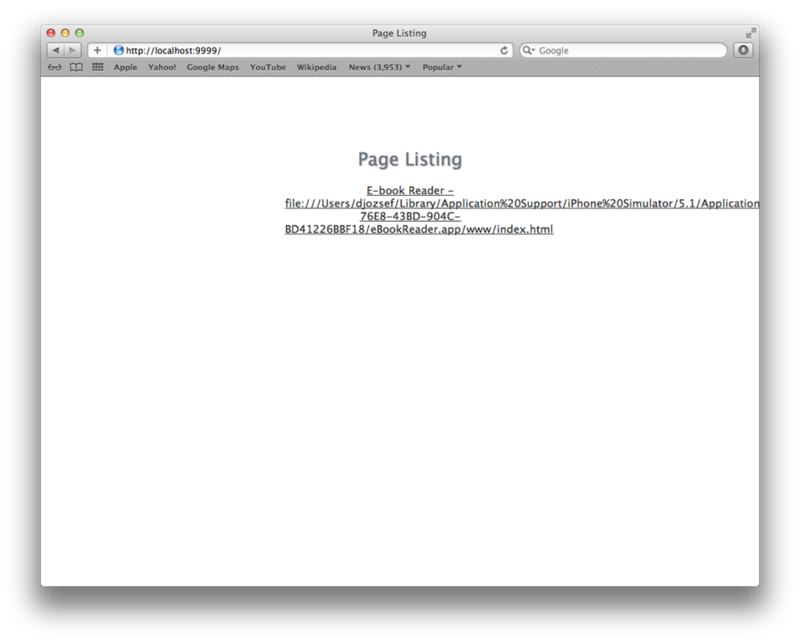 The official documentation says that if you wish to debug your UI code, you should load it as a standalone in a browser. Of course this has certain drawbacks. One is that the UIWebView, the iOS component that PhoneGap uses to display your UI, behaves slightly differently than the mobile Safari, and even more differently than the desktop one. 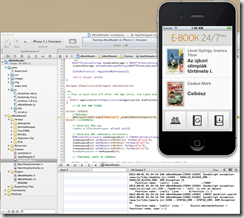 The other problem is that you won’t have access to the native PhoneGap plugins. We are going to reach behind the public API. Neither the class nor its method are published through header files, so we will use the NSClassFromString function to get there. If you are familiar with the concept of reflection from managed languages, this is something similar. It gives you access to a class based on a name given in a string. Note that the compiler will issue a warning, since the method you use is not declared in a header you included. However, due to the “duck typing” nature of Objective-C, the code will compile, and since the method does exist, will run correctly. Now what this does is slightly obscure, as you will find no changes from before when running the application. You need a little ninja finesse even to access the debug facilities. What has happened is that the iOS simulator has opened a port for access by a browser. 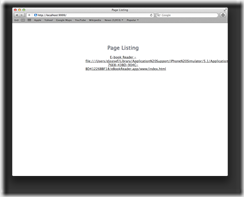 Open localhost:9999 on a browser, and you will be presented with a rather plain selection between the UIWebViews present in your application. If you are using PhoneGap, chances are there will be only one. Happy debugging… Just make sure to remove this code from your app before submitting it to the App Store, or else it will certainly be rejected without fail, for using nonpublic calls. 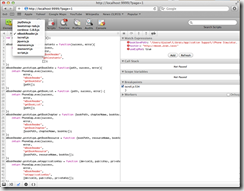 Another “secret” debugger is the DebugView included with PhoneGap. It dumps verbose debug messages on the output console while running. Note that this should also be removed from the application before submitting it for review. 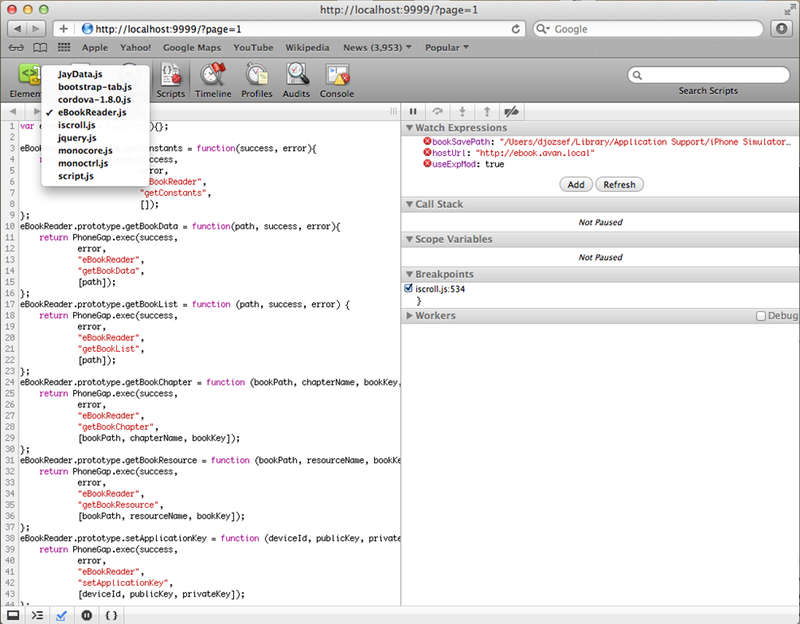 First, you need to locate the code, which is NOT included by default with the new PhoneGap project. Navigate to the PhoneGap library root (for me the installer created it at Documents/CordovaLib), where you will find a folder named “debugview” under “Classes“. Take this folder, and copy it under your project. If you wish to abide by Objective-C conventions, this belongs under the Vendor folder, as it is third-party code you integrate as source into your project. However, just compiling it into the project isn’t enough, you will need to use it to replace the default PhoneGap view object. 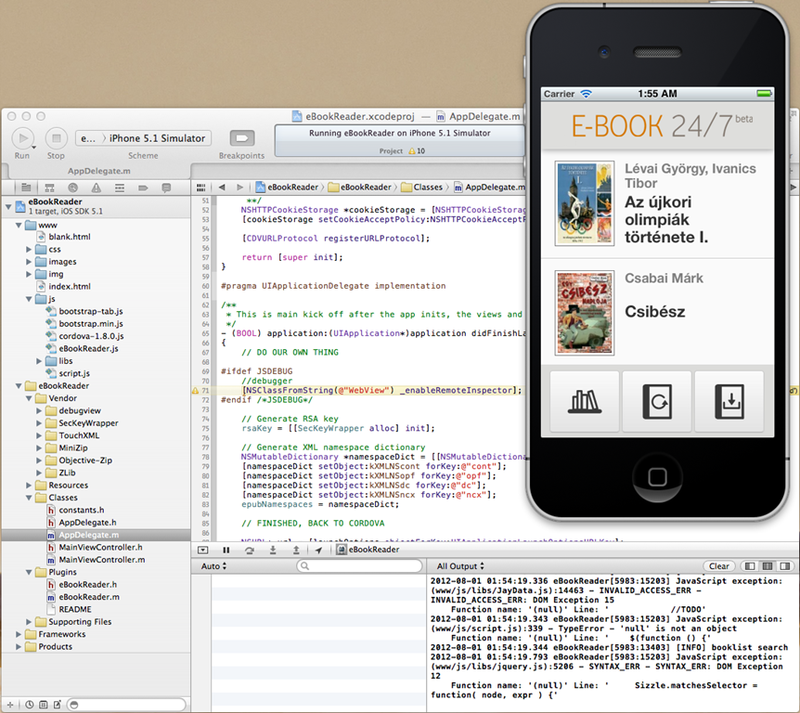 You can do this by overriding the newCordovaViewWithFrame method in MainViewController.h, as shown in the image above. 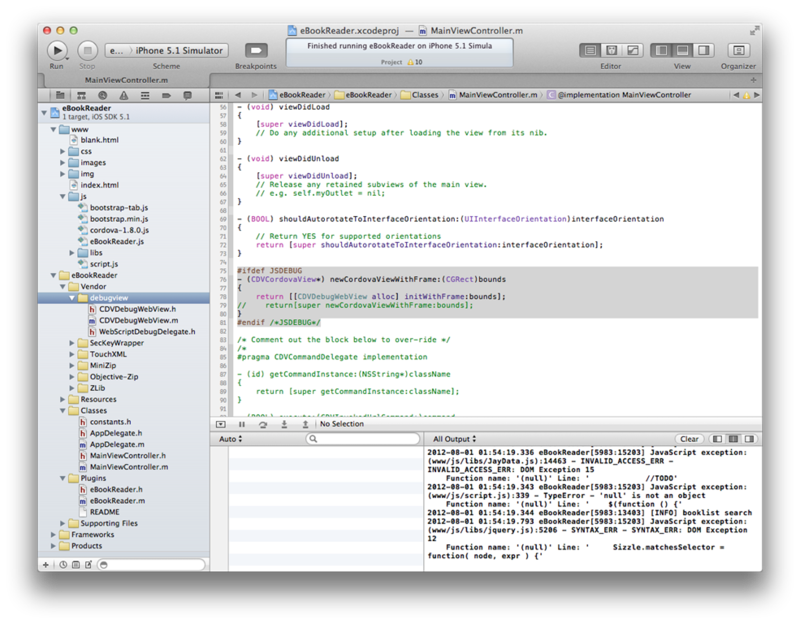 What eventually solved our problem was the event handlers in MainViewController.m. 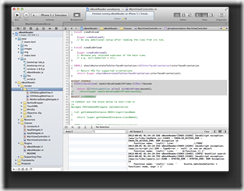 This class contains the event handlers for the application, even though most of them are commented out by default, as the handler implementations themselves reside in the superclass. Uncommenting these methods can serve two purposes. Either you wish to implement custom logic, or you wish to place a breakpoint. And this is what we did. The method names speak for themselves: webViewDidStartLoad, webViewDidFailLoadWithError, etc.